Great White fans have had to wait several years to hear new music. Their wait came to an end in January when Jack Russell’s Great White released their debut album, “He Saw it Comin”. 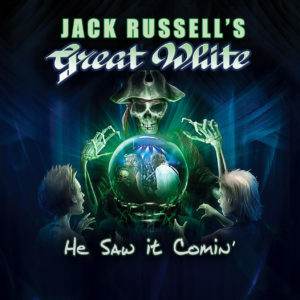 Former Great White and Current Jack Russell’s Great White singer Jack Russell spoke with BackstageAxxess.com and explained the reason for the long gap. “I was waiting for one reason, and that was to have the band that I knew was the band that I was waiting for. And when Dan McNay got into the band, I knew that this was the band that I was supposed to be recording with,” said Russell. Russell also says that touring after the song were written helped the band make sure the songs were exactly as they wanted. Jack Russell’s Great White will continue to tour this Summer as they stop by in Cadott, Wi for Rock Fest. They’ll help kick off the festival during Wednesday night’s “Bonus Bash” with RATT, Faster Pussycat and The Good Bars. The Bonus Bash is exclusively for 3-day ticket holders. 3-day tickets currently are priced at $89 and will go up soon. For more information and tickets to Rock Fest, log onto www.rock-fest.com.